ARB 12V/110V Portable Fridge Freezer. ARB fridge freezers are the ideal way to keep your food and beverages chilled or frozen on your 4x4 adventures, regardless of ambient conditions. 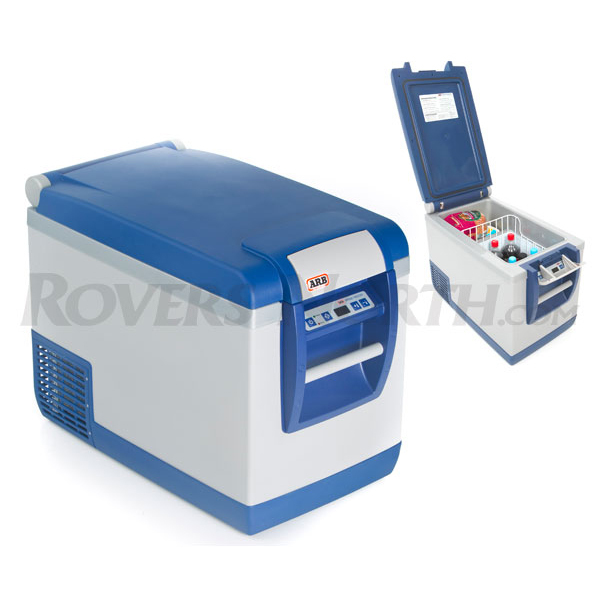 Not to be confused with less effective 12 volt ‘coolers’, the ARB unit is a true refrigerator/freezer. Own one and you’ll never again find your lunch water- logged by shifting ice, and there’ll always be a cold drink on hand during the sweltering summer months. Two separate power cords are included, one for AC operation (120 volt) at home, and one for DC operation (12/24 volt) in your vehicle. The all-new 50 qt model is able to maintain sub-freezing temperatures in 90° F heat, while only drawing 0.87 amps per hour from a 12 volt power source… that’s less than a single headlamp draws! *The duty time & amp draw will be determined by the ambient temperature. Where practical and possible, bring the freezer fridge to the required temperature where a limitless power source is available. Quoted figures are based on a 12 volt power source.